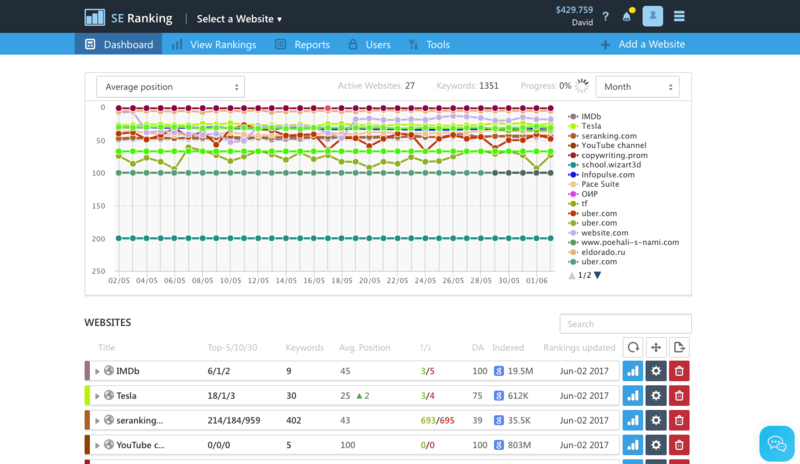 SE Ranking is a cloud-based platform for SEO and online marketing professionals that provides a complete set of tools for comprehensive site audits, competitor analysis, website ranking, keyword suggestion and grouping, backlink monitoring, automated professional reporting, and much more. Besides standard SEO tools, the system offers a set of additional features such as White Label and Marketing Plan aimed at bringing your professional digital services to a whole new level. All on one platform within the same user-friendly interface. SE Ranking offers a variety of unique value propositions to its users which include 100% accurate ranking results for the majority of search engines with advanced keyword analysis, keyword grouping, the ability to show which page of a website is ranking, and track Google Local and map results. Users can also check rankings at different intervals ranging from daily checkups to less frequent intervals. The platform is useful for experienced SEO and marketing gurus as well as newbies. For large projects, users can easily monitor an unlimited number of keywords, create multiple users and logins, and manually edit any changes. SE Ranking allows users to complete a variety of tasks including analyzing websites on hundreds of SEO-related parameters, detect critical errors; track, filter, and disavow backlinks; discover great sets of short-tail and long-tail keywords; enhance marketing activities by following a comprehensive marketing plan suitable for both SEO newbies and experienced gurus; track social visibility and manage all profiles in one place; generate branded reports both in manual mode and on a scheduled basis. Still not sure SE Ranking is right for you? Use our Product Selection Tool to compare other Marketing software solutions. Have questions? Call one of our unbiased Technology Advisors for a free consultation. Learn everything you need to know about SE Ranking. Our experts will reach out to you shortly.